Earl White was in the Royal Canadian Navy, stationed in Toronto, Ontario and Dartmouth, Nova Scotia, when he first entered diving competition. In 1943, he won his first competition in Barrie, Ontario. He then competed in the Dartmouth 195th Naval Day competition where he gave a graceful exhibtion of diving skill and style to capture the Maritime Diving Championship, and the coveted Bud West Trophy. Following the war Earl returned home and along with his brother Leon, built a high-bar in their backyard where Earl improved his gymnastic skills. Eral was very active in the community both as an athlete, and as a volunteer. He became Captain of the NFCVI gymnastic team, and later, assistant coach of the Stamford CVI team. Earl was a senior leader at the Morrison Street YMCA and a volunteer instructor in swimming and gymnastics at the Boys & Girls Club. He also belonged to the winning Man-A-Mile team of 1947. 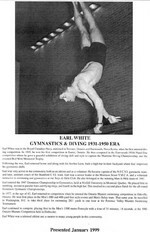 Earl entered the 1947 Dominion Championships in Gymnastics, held at McGill University in Montreal, Quebec. He placed first in tumbling, second in parallel bars and flying rings, and fourth in the high bar. This resulted in a second place finish for the all-round Dominion Gymnastic Championships. In 1977, at the age of 62, Earl returned to competition, when he entered the Ontario Masters swimming competition in Oakville, Ontario. He won first place in the 800 and 400 yard free style events and men's relay team. That same year, he traveled to Washington D.C. to take third place for swimming 2811 yards in one hour at the Potomac Valley Masters Swimming Tournament. Earl continued to compete, placing first in the Mens 1500 metre Freestyle with a time of 31 minutes, 14 seconds, at the 1981 Ontario Masters Competition held in Etobicoke. Earl was a talented athlete and a mentor to many young people in this community.